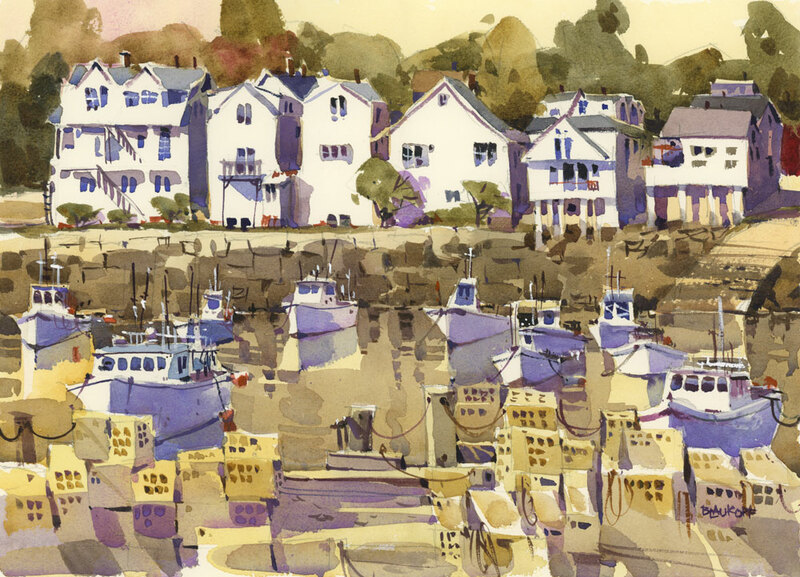 One of the reasons the Rockport harbour is so interesting to paint is that it’s enclosed on all four sides. Seems odd for a harbour but if you look carefully you’ll discover that there’s a small, hidden channel for boats to move in and out of open water. This enclosure makes for many great painting spots depending on the time of day and the position of the sun. I love the north side of the harbour because there’s a grassy area with benches — perfect for contemplating the view… or painting. Saunders Waterford CP paper, 15″ x 11″. 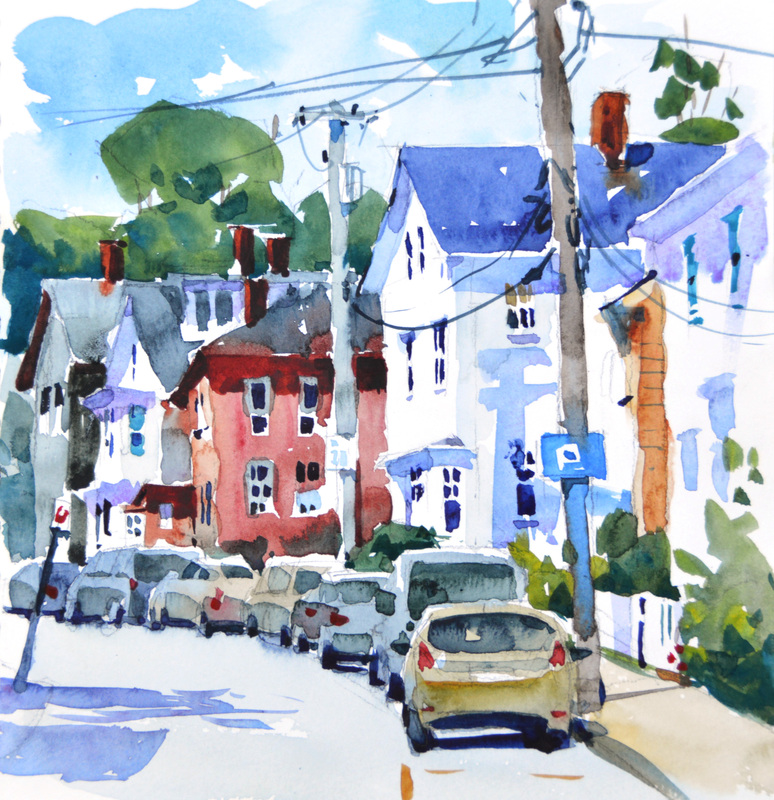 It seems like a landscape sketching workshop in an urban setting like Boston would be unlikely, but I am just back from two days of teaching with the Newton Watercolor Society. 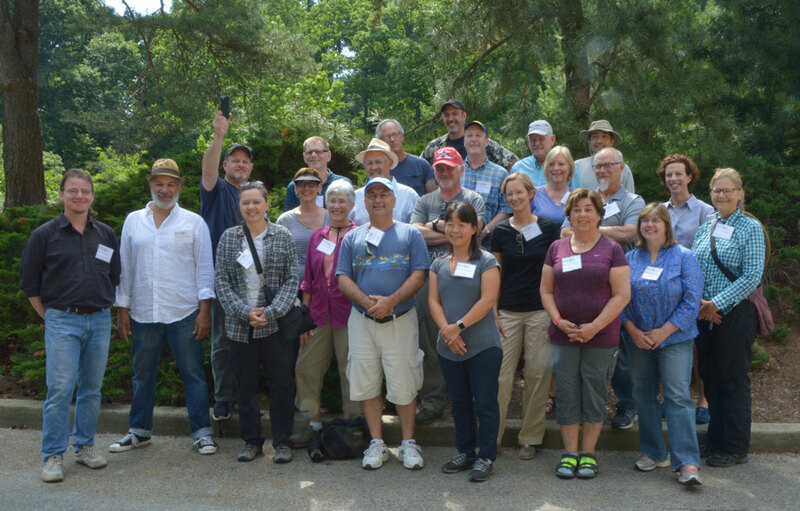 The first day of the workshop took place in Auburndale Cove, a bucolic setting in a suburb of Boston, complete with a shaded park, Canada geese, waterlilies and great river reflections. 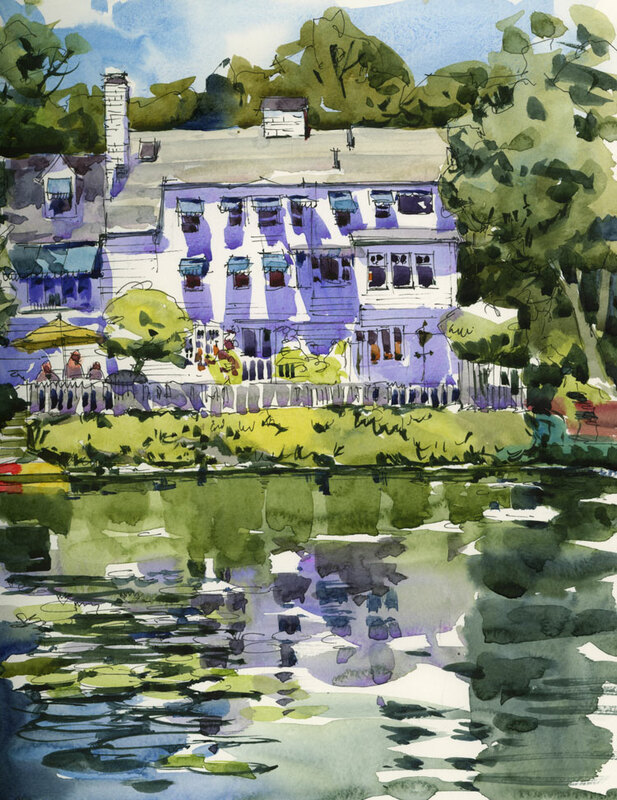 Even though it was a day for sketching landscape, for my first demo I couldn’t resist drawing a house across from us on the Charles River. The shadows cast by the awnings on the white clapboard were so remarkable, so dramatic and so sharp that I had to paint them first. That’s not my usual way of working. In fact in my online class Sketching the City I go into quite a bit of detail about how to add these in near the end of the sketch. But since they were likely to change quickly and they were on a white surface, I painted them first and then proceeded to paint the rest of the page. During a long workshop day I like to do a second demo, and I’ve discovered lately that a good time to do that is at the end of the afternoon when students are tired and quite happy to sit and watch. This second demo is usually something less complex, perhaps a smaller vignette or a closeup view — on this day some waterlilies. If I had been quicker with my camera I could have also captured a family of ducks that silently swam through the scene while I painted. The day’s paintings by the group were immensely successful and of course the day ended with the obligatory Urban Sketchers photo of everyone proudly displaying their sketches. On my last morning in Rockport I woke up really early and decided (even before coffee!) to tackle a full painting of a scene that I had sketched a few days earlier. It’s funny how the brain works. Six days earlier this seemed too complicated to paint (rusty painting skills, rusty drawing skills, not relaxed, etc.) but after a week of painting every day I was ready to attempt it. When I sketched the scene the previous week my intention was the same — to create a focus on the buildings just after sunrise when they are at their brightest. With a multi-layered scene like this (traps in the foreground, boats in the middle, houses and trees further back) a limited palette seemed to be the best way to achieve the type of unity that I wanted. I haven’t used much Raw Umber or Burnt Umber recently, mostly because they dry up and get too hard in the palette but I had them in my paint bag and squeezed out a blob of each. When you use them fresh they are very granular and wonderful. Almost gritty in texture. Along with a dab of Ultramarine and some Cobalt Violet, that made up the limited palette. The scene was remarkably different a few hours later when I put my brushes down. The light was not quite as sharp and most of the boats had made their way out into the open water. 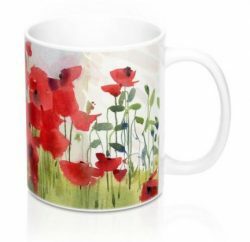 Painted on Saunders 140 lb CP, 15″ x 11″. 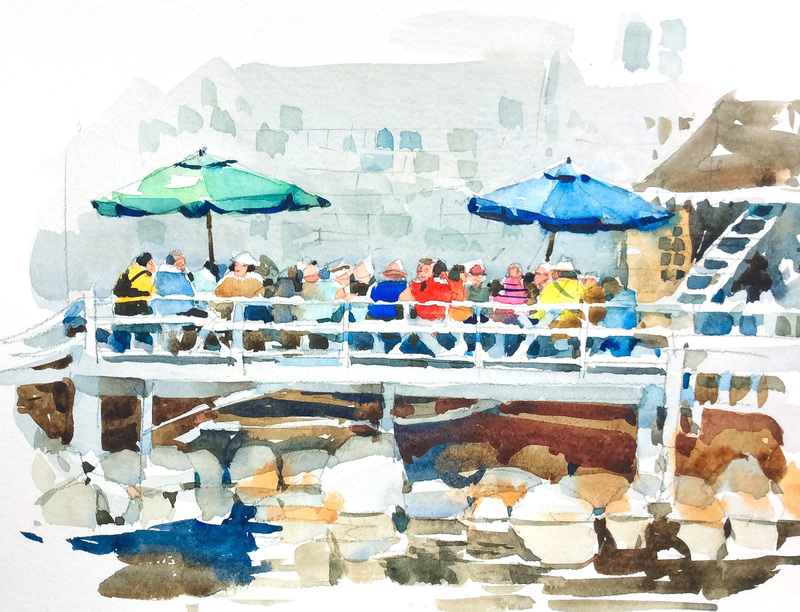 I’m just back from a fair bit of travel: a week in Rockport followed by a workshop in the Boston area, and in the middle of that the Plein Air Invitational at the New York Botanical Gardens. Lots of driving, lots of painting and now a pile of scanning to do. 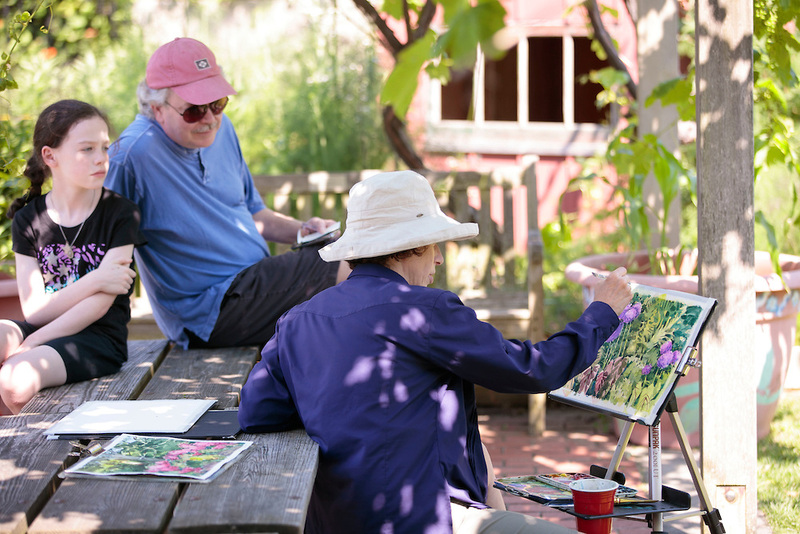 It was a highlight of my summer to be invited to paint amongst a world-class group of painters at the Botanical Gardens. 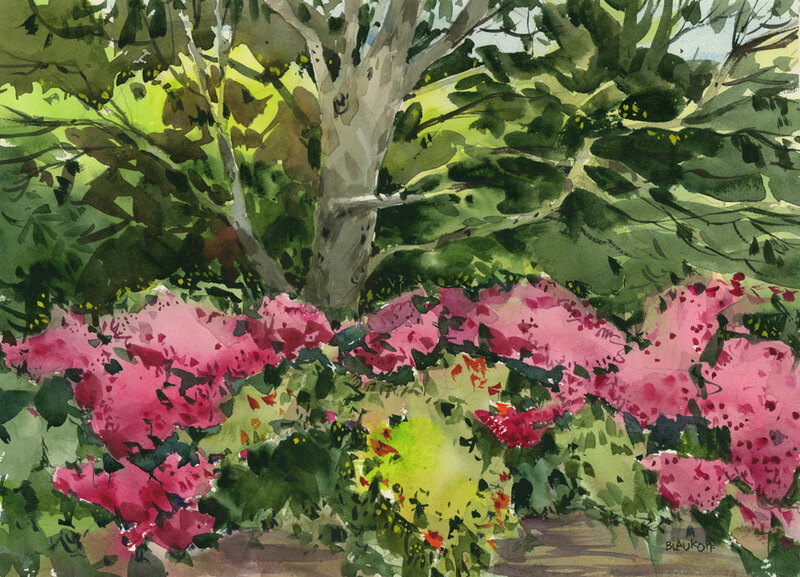 There were about two dozen of us scattered around the grounds, painting in the rose garden,the family garden, the native plants area and around the conservatory. In a week or so, I’ll post a link to all the paintings completed during the course of the day by this fabulous group of artists. In the meantime, here’s what I did. My morning location was the rock garden — a quiet hideaway on the grounds with a waterfall, a pond and in a far corner an explosion of colour — the last of the azaleas in bloom. It was a perfect shady spot with hardly anyone walking by, but by lunchtime I started to think it might be a little too quiet. Mingling with visitors and having them watch us paint was the purpose of the event, after all. 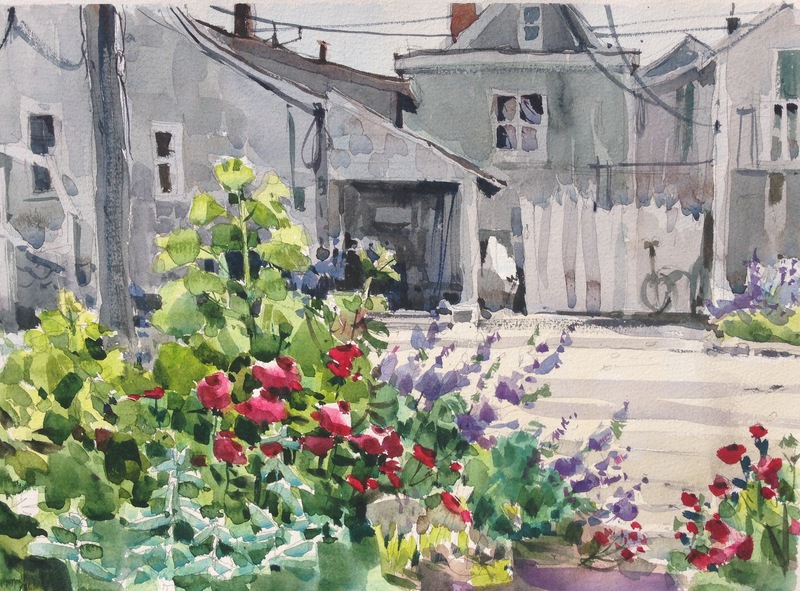 In the afternoon I moved my painting gear to the family garden and found a shady spot under a grape arbour. From that location I had a view of a dark corner blooming with allium. With a picnic table behind me, it turned out to be the ideal place for visitors to stop by and chat. I guess after so many urban sketching outings, I am used to talking and painting at the same time, and I met some wonderful families who kept me company for a time. Thanks to artist-in-residence James Gurney and everyone at NYBG for organizing the event and welcoming us to these spectacular gardens. Lunch at Roy Moore Lobster Co. is a quick affair. Order your lobster roll or clam chowder inside and either take it away or eat it outside on a picnic table on the back deck. Possibly sharing a table with complete strangers. From my chair across the little bay I can watch this crowd for hours. The rounded backs of diners tells me everything. These are people enjoying their food. They are an easy crowd to draw. When one group finishes eating and moves on, they are replaced by another group who assume the same positions. Yellow shirt, blue shirt or striped shirt, it doesn’t matter. It’s just spots and dots of diners doing some serious eating. The lanes behind main streets are often more interesting to me than crowded thoroughfares. That’s where the good shapes happen. I’ve painted in Rockport quite often and even though the harbour is endlessly fascinating, I thought I’d explore some back streets this time. This tumbling garden and a backdrop of weathered wood houses is directly behind Bearskin Neck, the main drag where all the tourists stroll. I was intrigued by the contrast between colour and monochrome in the scene. 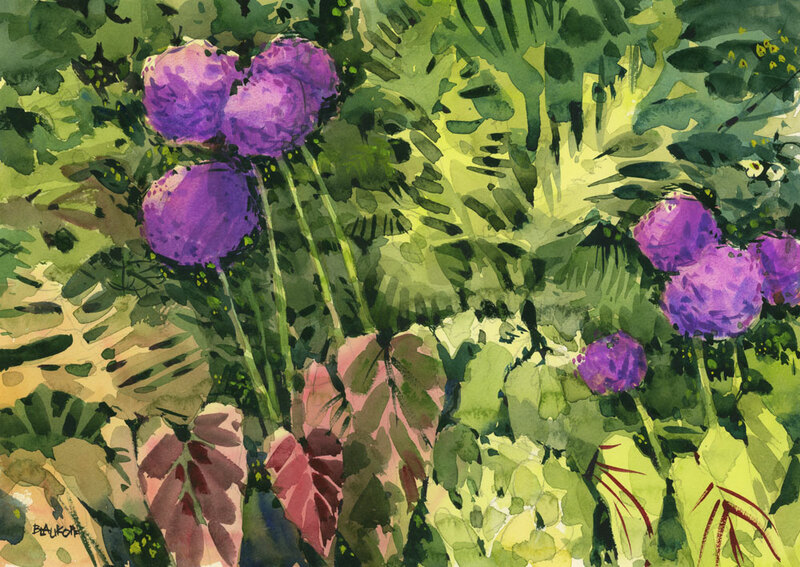 I’m also just back from an exciting day of painting at the New York Botanical Gardens. I have photos and paintings to post but I’ll wait until I return home and have access to my trusty scanner.